Norman Atkinson OBE with the plasticine figure, which will be stored after casting. The last uncast model of celebrated Angus sculptor William Lamb will be preserved for future generations as a bronze statuette. The artist sculpted important figures of the early 20th Century such as the late Queen Mother and both the Queen and Princess Margaret as girls, but died in relative obscurity. He is memorialised at his former Market Street studio in Montrose, where much of his work remains today. 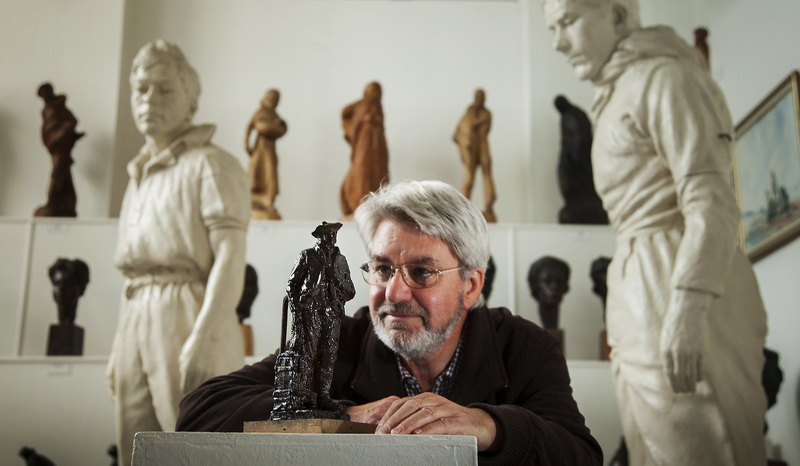 One uncast figure remains – labelled Man Wearing a Glengarry – and the studio’s custodians have secured council consent to cast two bronzes from the plasticine. While the Friends of the William Lamb Studio will pay for the work, Lamb passed on his collection to Montrose Town Council on his death in 1951, and legal responsibilities have passed via Angus Council to the Angus Alive trust. Chairman of the Friends, Norman Atkinson, said the studio is the “hidden gem of Angus” and the model may have been a rough draft of a larger project that never came to fruition. “This little figure is very unusual. I don’t know why he produced it in plasticine,” he said. “Everyone was a bit afraid to touch it and it’s only in the last year or two that I thought maybe we were being a bit too cautious. “Plasticine as a medium isn’t going to live forever. A meeting of the council’s Communities executive subcommittee approved the work on Friday, with the proviso that further copies can only be made with their approval. The professional adviser to the William Lamb Studio advisory committee, galleries curator Jim Boon, will oversee and approve procurement for the job. One bronze edition will be presented to the studio for public display, and one copy will be mounted and presented to Montrose Academy as the Lamb Art Prize, to be awarded annually to the outstanding student of drawing in S1, S2 or S3. The studio is now maintained as a small museum and gallery of Lamb’s internationally important works – sculptures in wood, stone and bronze, etchings and water colours, and more than 1,700 preparatory drawings. In 1932 Lamb was commissioned by the Queen Mother, who was then Duchess of York, to model portrait heads of her daughters. Impressed by his skill, the duchess also commissioned Lamb to produce her portrait.